Especially for a hedge fund. Originally highlighted at MarketFolly, the "Ebullio Commodity Fund" was down 86% in February, and 95% for the year. "February 2010 was the worst month in the history of the Ebullio Commodity Fund and we regret to report a return of –86.25 pct for the month, which brings our total return for the year to –95.83 pct and to -89.63 pct since inception. Some extraordinary circumstances forced the Ebullio Commodity Fund to liquidate and/or cancel parts of the physical book and to liquidate some long held speculative positions, mainly in LME non -ferrous metals." "Either we are going to get hyperinflation and all tangible assets will explode 100 pct or more to the upside, gold will be at $5000/oz and paper money is history. 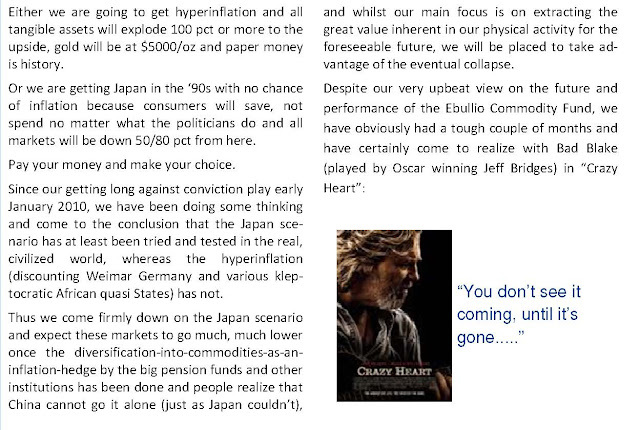 Or we are getting Japan in the ‘90s with no chance of inflation because consumers will save, not spend no matter what the politicians do and all markets will be down 50/80 pct from here."